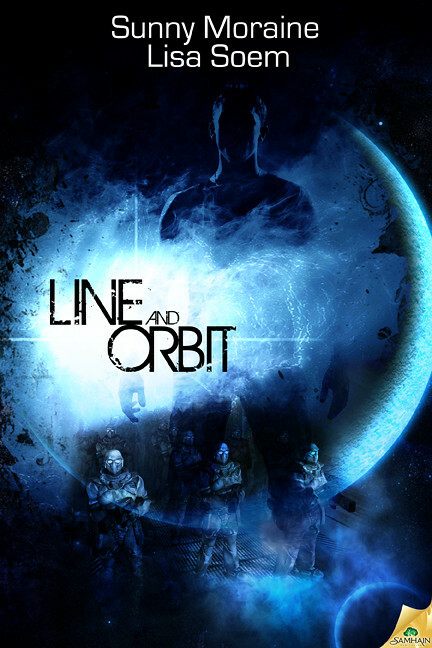 Line and Orbit: Ten things to know about it. With cover art! Now that I have imagery to work with, I’m starting Big Gay Space Opera Promofest 2012. Yeah, I’m going to be annoying about this. It’s my precious baby and I’m one of those irritating Facebook moms. Sorry I’m not sorry. To that end, let me kick things off with some info. It started with a very simple idea. My coauthor and I were friends before we were coauthors, and one day I was all like hey you wanna write a book together and she was like hey yeah totally and for some reason the idea we both hit on was SPACE NOMADS, which was actually what the working title jokingly was for a while (yes, all in caps). The singular seed of an idea from which the entire book sprang was massive generational ships moving through space, containing a wild mix of almost every kind of human culture imaginable–that and the giant, ancient trees of Ashwina’s Arched Halls. The rest of the plot unfolded very much as we went. It used to be much, much longer. The first draft was around 165k words when it was finished. Now it’s closer to 111k, which is still very hefty–and space opera lends itself to length as a genre–but that’s still almost an entire novel’s worth of wordage that was cut from the initial draft. The thing about editing something of this length is that no matter how much you think you’ve carved away, there’s almost always more that can go. But we really love some of the scenes that didn’t make it into the final draft, so I’d expect to see a few of those pop up as freebies as the release date draws nigh. It’s not the first story published in this universe. Want to know more about Kae, Lochlan’s friend and conscience? Read “Thin Spun” in Hellebore & Rue: Tales of Queer Women and Magic. Want to know more about Ying, the healer? Read “Starcrossed” in Help: Twelve Tales of Healing. And you should own both of those anthologies anyway because they’re awesome. It’s diversely queer spec fic, not just M/M. When we started this, one of our guiding ideas for the nomadic Bideshi was freedom and inclusiveness. As a people they’re bound by a great deal of ritual and tradition–some of which can be hard and constraining and even cruel (see “Thin Spun”) but they’re also accepting of people of all kinds and colors and faiths and loves. They have to be; they can’t afford to turn many people away. To that end, we wanted to represent a rich tapestry of individuals and relationships in this book. We have characters of all kinds–gay, pansexual, lesbian, straight. One of our big secondary characters is a trans* person. This isn’t to toot our own horn or present ourselves as THE BEST ALLIES EVAR but merely to call attention to something that we’re trying to do very consciously, and at which we hopefully haven’t completely failed. It’s going to be available in print as well as a plethora of ebook formats. The print edition will follow the ebook edition by a few months, most likely. Watch for giveaways when it’s available. It’s got an ensemble cast. Something that’s common to a lot of the SFnal shows and movies that we love are these fantastic collections of characters. Battlestar Galactica. All the Treks. Firefly. This was something else we very consciously tried to do here; we have two primary characters but honestly I love our secondary characters just as much if not more so, and I hardly feel like it’s fair to call them secondary. I hope you’ll come to love Adisa and Ixchel and Kae and Leila and Ying and Kyle and Eva as much as we do. No, it’s not purposefully based on Gattaca at all. Genetic engineering is a primary component of the plot, and it was only after we were about halfway through with the draft that I realized that… hey, parts of this look kind of like Gattaca if you squint. So there’s probably some unconscious influence there, but it wasn’t intentional. I’m sure you can pick out any number of other influences as well (I had District 9 very much in mind when we created the insectoid Kitchit). It’s my first novel. It’s not the first novel-length thing I’ve done, but as far as publishable stuff goes, this is the first one. Which is super exciting. It may have sequels. The end definitely leaves itself open for them, and I have some rough ideas. A lot still needs to be worked out and I have some other things I want to work on first, but it’s definitely on the table. I need your help. One of the primary ways that books get sold now–especially books that don’t have big names behind them–is word of mouth. So if this sounds like something you’re into, if you like to see this kind of work out there, help me talk it up. Link stuff around (I’ll have contests that will provide additional incentive!) If When you get a copy, review us on Goodreads and/or Amazon. This thing pretty much came from the internet and I think the perfect audience is here, but no one can get it if they don’t know about it. And we’re just two people. So help us! This is the Big Gay Space Opera That Could. Help us make it… could… better. Or something. No hard release date yet; still looks like late 2012/early 2013. Will be yelling obnoxiously about it as soon as I know something for sure. This entry was posted in Cover art, Line and Orbit, News, Science fiction. Bookmark the permalink. I’m happy to give you a full-page free ad in ICARUS if you want it. That would be amazing, Steve! Thank you so much! The cover is awesome and gorgeous! So I would need the ad by the end of the month.